For the Grace of: Beauty, naturally. 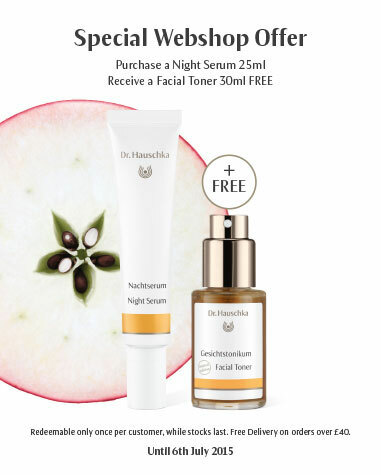 Dr. Hauschka, I have to say, is a god send. If you're not familiar with that name, you may be picturing a greying German man in a white doctor's coat. But no. This German brand delivers natural, effective skin care and beauty products. And by natural, I mean, the ingredients lists are BEAUTIFUL, yet the product itself resembles luxury, top quality brands, not a kitchen cupboard concoction, or, an 'I made this myself' Lush tub of something wittily named. A fusion of plant science, raw materials from their own medicinal herb garden and a passion for natural beauty, let me tell you: I am in love. Honestly, for using their Quince Day Cream, my skin has never looked or felt better; this cream sinks in like a dream, and gives a smooth, clean appearance. And, with the most divine fragrances, every facet of their products will make you feel healthy, beautiful and amazing. My recommendation for the summer: lighten up your chemical load, and look fabulous. I'm a fanatic ingredient reader. Ever since I was a teenager and I made the connection between what I put in my body and how I felt/looked, I've been obsessed with knowing and understanding these sometimes scary and lengthy lists. If you want to be healthy, this is a must. Many people still overlook this, don't know or simply don't care, which is why so many products out there are still so full of artificial crap. This is not good for our bodies, ravaging our health and our looks. This ingredient reading habit isn't so unusual in a supermarket. In a drug-store, however, you can get quite a few strange side eyes, or bewildered comments from friends, "what are you doing?" It's not always easy when society is rolling it's eyes at you, but read anything on this (for starters) and you'll wonder why these horrific concoctions, sold to us as health and beauty care, haven't been banned - or at least plastered with warning labels (I'll give you a hint, and it's to do with profit). Descriptions such as 'penetrates deep into the skin' should send chills of terror down your spine. It ain't cheap living the natural life, however (unless you're not a compulsive beauty addict), so, if you can't afford to have a whole arsenal of quality, divine natural products (I have my fantasy bathroom all planned out in my head.... oh, one day...), I employ this rule: if it sinks into your skin, then invest! Knowledge is power: moisturiser, foundation, liquid eye-liner... next time you're shopping for these, read their ingredients. How many of these ingredients do you recognise? How many don't you? Take three. Google them.